Most karate styles, especially of Okinawan origin, include kobudo (weapons nee farming tools) as part of their curriculum. While your hand-to-hand combative skills are taken with you wherever you go, walking around town with your prized nunchaku draped over your shoulders to ward off the bad guys is ill-advised. Some of these traditional weapons (such as the nunchaku) are illegal to carry in some US states and abroad. So to assuage the attention that one would normally get from traipsing about looking like a feudal warrior, a line of nifty hand-held devices have been created that are both concealable and effective for self defense. 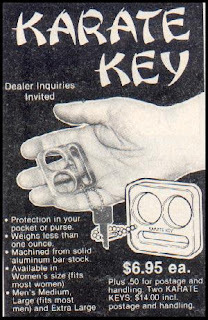 In the 70s, Tak Kubota of gosoku-ryu karate introduced the Kubotan, a five-inch plastic mini-baton that attaches to a keyring. Kubota originally intended his creation to be used by female police officers and offered an array of convincing pressure-point techniques that could be used to subdue a violent, non-compliant suspect. Since its appearance, a number of variant knockoffs have been made available to the public that have been modified with spikes or prongs, but the legality of these newfangled doodads are questionable. In the United Kingdom, the Kubotan has been classified as an offensive weapon, but for the most part remains unregulated in the US. An Isshinryu karate instructor from my area teaches one version of the Kubotan called the shu-chu as part of a self-defense course in her school. The techniques are simple and prove to work quickly, as it takes about a second to make uke tap out or drop to the mat. Some of these items have been influenced by Asian martial arts, but others just hawk the martial arts moniker for hype. Keep that in mind the next time you want to purchase a "ninja" keychain. Interesting weapon. I've never heard of it but, leave it to you to find out about it. You are certainly the "all knowing" and I'm always impressed! There were pencil defence courses given at my old shotokan school. These things are fun. But even a pencil, I don't always have. The only thing I !almost! always have is my keychain. Love that ad. I especially like the reference to men's size's in medium and large. What exactly does that Karate keychain do? Are you supposed to stick your attackers fingers in the holes and then slice them off? Provided people get a proper tutorial(such as through that instructor you mentioned) on how to use kubotans, then they are handy to have around. Thanks, Miss Chris - you've made my day! Thanks for the link. Looks like you could make a devastating hammerfist with those nasty things. I've heard of the pencil defense. It's amazing what you can turn into a weapon. The trick is to use something that's otherwise inconspicuous (like keys or a pencil). Yes, that was very thoughtful of the advertisers - maybe they should've offered ring sizes instead! Taking a class for the Kubotan really is recommended. And the problem with pepper spray occurs if the sprayer is outdoors facing the wind. We incorporated the travel wrench into some of our training and it was easy to draw out and use in conjuction with normal hand techniques. In the manual, the travel wrench is supposed to allow you to augment finger grabs, but really, when you're holding it, the first thing that comes to mind is to strike the opponent. I am of the mindset that any weapon you have should be drawn as late as possible. I'm not advocating that the opponent should strike first, I'm saying that the opponent should not see that you are with a weapon. Any practitioner should be confident to generate a lot of power (or strike very effectively) unarmed anyway. And if you can't you should keep practicing for this. I also like the advice for pepper spray users - use the pen or kubotan in front of you. Pepper spray is held back, unseen, and used when you know you're going to hit the bullseye (ouch). I've heard of it but never have trained in it. I have training in the nunchuka, baton (from DOC and Army), and a *little* training with the win chun butterfly knife. However, I've forgotten just about all of the knife. I carry chuks in my car and have several batons at home. Sadly, pretty much everything is legal in Indiana. Several times I've seen men at the local mall with a pistol strapped to their belts! Being not from "here" neither my wife nor myself can believe it! Other handy weapons are a rolled up magazine and an antenna from a car or truck. It hurts more if one jabs with the magazine intead of striking with it. An antenna would really hurt too because it's light and not easy to catch. Many years ago, when I was very young, I worked in security at a hotel. I had a pair of sap gloves - leather gloves with 4 oz of powdered lead sewed into the knuckles. A retired policeman on the staff also showed me some of the fine points of using brass knuckles. Any practitioner should be confident to generate a lot of power (or strike very effectively) unarmed anyway. And if you can't you should keep practicing for this. I think you'll agree that one problem with some of these weapons is that the user might become psychologically reliant on them in lieu of regular unarmed techniques. Several times I've seen men at the local mall with a pistol strapped to their belts! Being not from "here" neither my wife nor myself can believe it! It's the items that are concealed you have to watch out for. I had a delivery to a DOC training academy in New York recently. They had a room with a showcase of all the makeshift weapons they had confiscated from inmates. I won't go into detail, I'm sure you've seen your share, but some of these devices were pretty ingenious. I've heard how formidable a rolled up magazine can be. And if I'm not mistaken, the antenna was the inspiration for a fold-up type of weapon that was heavily advertised years ago. Sap gloves with lead and brass knucks? That hotel must've been in one tough neighborhood! Thus the saying for a user with a hammer, everything becomes the nail. It is amazing when you see the Hollywood hero clash with swords, and then uses his free hand to strike the opponent. One of the first few lessons in my school discusses why we lunge forward with our hips and shoulders directed forward - so that we can strike with either hand! But it then takes many years to figure this one out! Although I can see the use of these "weapons", I wonder if the brief moments of training with them would create enough experience for me to use them effectively. I spend many hours learning to use my hands and feet, but rare moments to learn how to use pencils, papers, pepper spray, and keychains. If I had to pick a weapon for self defense during those few precious seconds of Self defense, I believe that I would turn to what I know well, and have practiced the most. Your point is well taken. The practice of weapons (I'm talking about the traditional variety here) in karate obviously doesn't get the same level of treatment as the empty-handed material. Some styles (like Okinawa Kenpo) do emphasize kobudo, but let's face it, karate is hand-to-hand combat, and that's its focus of training. How we train is how it happens.